Discover practical ways to improve students' understanding and achievement in mathematics. Help students become more sophisticated math problem solvers and more insightful mathematical thinkers through a powerful new approach that adapts reading comprehension strategies for students to use in mathematics. Facilitate meaning making and help students develop self-awareness and monitoring in mathematics by showing how to make connections, ask questions, visualize, infer, predict, determine importance, and synthesize in math the way they have learned to use these strategies in reading. 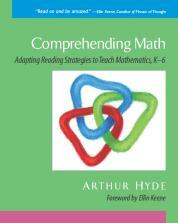 This seminar, based on Arthur Hyde's Comprehending Math, provides educators with step-by-step ideas and specific advice on strategy-based teaching that is designed to help students understand math concepts more deeply and use that knowledge to solve problems.